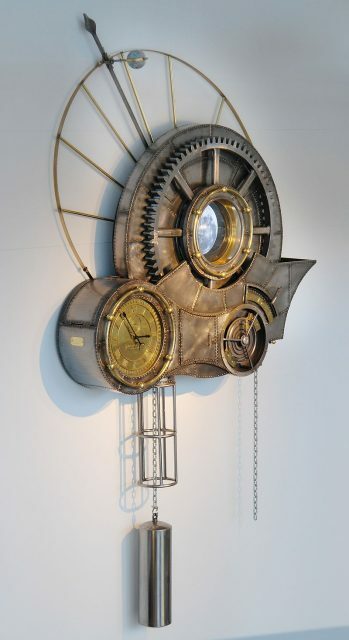 Before steampunk developed its own subculture over the last decade or so, it started as a subgenre of literature, specifically of science fiction/fantasy. 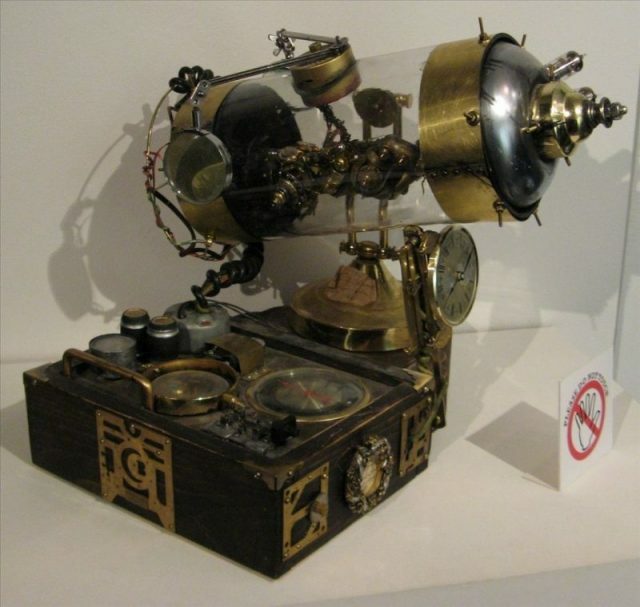 “Steampunk” is word that was coined in the 1970s to describe stories that celebrate the adventurousness and technological progressiveness of the Victorian Era; the genre actually first came into being at the same time as the scientific romance, an early name for science fiction, back in the actual Victorian Era according to Steampunk Magazine #2. Some of the earliest written works of this type included stories by Jules Verne, H.G. Wells, Edgar Rice Burroughs, and Mark Twain. Those writers, in turn, were heavily influenced by the work and discoveries of leading scientific minds of the time, like Thomas Edison and Nikola Tesla, and the reigning social bents toward technology, heavy industry, and colonialization. The August 1927 issue of Amazing Stories featuring work by H. G. Wells. All of those factors, together, made for a body of fiction that is a little hard to define. Some early stories were American novels that dealt with issues of technological progress and the expansions that could arise as a result. Some were about discovering new worlds, such as Verne’s Journey to the Center of the Earth, and still other stories were studies on what can happen when the wonders of technology are meddled with for malign or foolish ends. By World War I, scientific romances became less popular, replaced by the burgeoning ideals of superheroes and the exploits of adventurers. Even so, you could still see those stories popping up in both silent films and early films with sound from the 1920s and ’30s, although they were usually set in what was then the modern day. 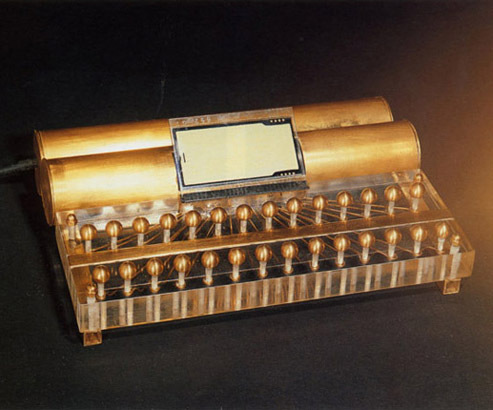 The attempts at updating weren’t, by and large, very successful, since enough time had passed that a lot of the technology being envisioned by writers like Verne weren’t speculative anymore. 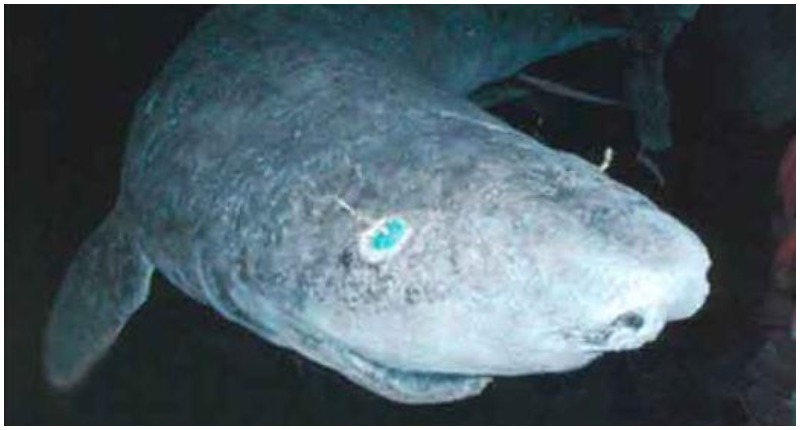 They had already not only come into being but had become common enough that they just seemed anachronistic and dated. 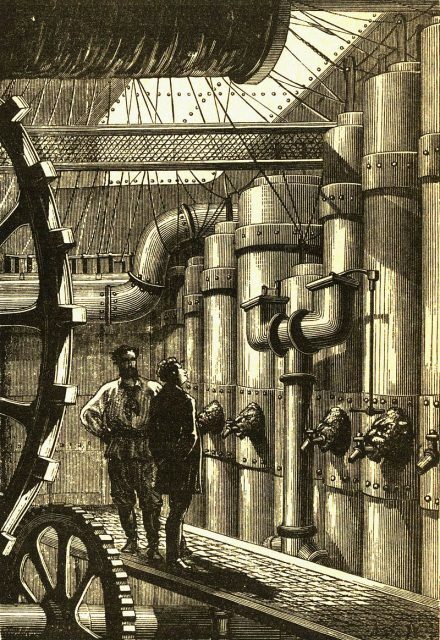 Original illustration of Jules Verne’s Nautilus engine room. That’s the point at which the film industry started to come to the conscious decision to leave those stories in the Victorian Era, rather than trying to make them more modern. The genre began to take a feel of alternate history, melding the culture and history of that time period along with fantastical and futuristic science. Steampunkforge.com has a slightly different perspective on how the phenomenon of steampunk came into being. At the outset, the genre can be further divided into several distinct types, including Steampulp, Gaslamp fantasy, Victorian Science Fiction, and Les Voyages Extraordinaires, noting also that romance is a common element in all them. 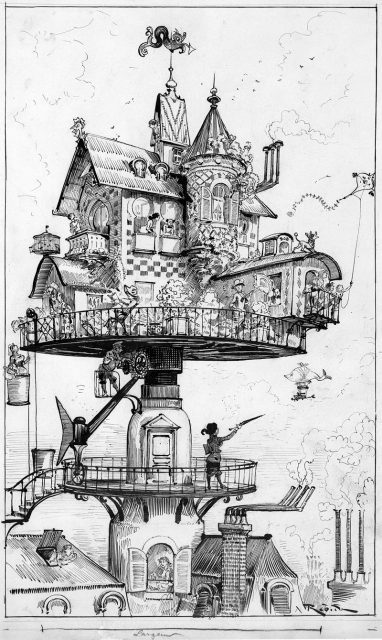 ‘Maison tournante aérienne’ (aerial rotating house) by Albert Robida for his book Le Vingtième Siècle, a 19th century conception of life in the 20th century. Gaslamp refers to stories that are in urban settings in the U.S., Canada, or other Western countries and are usually set during the Victorian or Edwardian era. Victorian Science Fiction is set in Europe, and almost always in England. Les Voyages Extraordinaires can be set in any exotic location, ranging from the jungle to the moon. Steampulp primarily refers to things like 1950s horror movies. The common threads among all types, however, remains science and technology, including clockwork, steam engines, and occasionally powered flight, but only in the context of dirigibles (blimps) and airplanes with propellers. As a body of work, Victorian fashion and culture is very common. Protagonists are often of the upper classes, and mad scientists are ubiquitous, whether they are the heroes or the villains of the piece. Female characters are often seen as equals to male characters, too, despite the fact that wasn’t the case in the actual Victorian Era. What really varies between these two histories is that Booker’s Steampunk Magazinearticle talks about the 19th century, but the Steampunk Forge discussion goes significantly farther back, in fact, nearly a thousand years farther back. In the anthology One Thousand and One Nights (also known as Arabian Nights), there are references to automatons or robots. One story features humanoid constructions and another features a mechanical flying horse that could be controlled by keys and travel through time. Sir Francis Bacon published Novo Atlantis in the 17th century, an unfinished novel that was a utopian story of the Les Voyages Extraordinaires mold. By the early part of the 19th century, Mary Shelley began the rise of the mad scientist figure in her Frankenstein; or, the Modern Prometheus. While Verne’s Journey to the Center of the Earth is considered to be the first “true” steampunk novel, the roots clearly lie in these earlier works. Early pioneers in the genre aside, it was the film industry that carried steampunk through the next several decades. 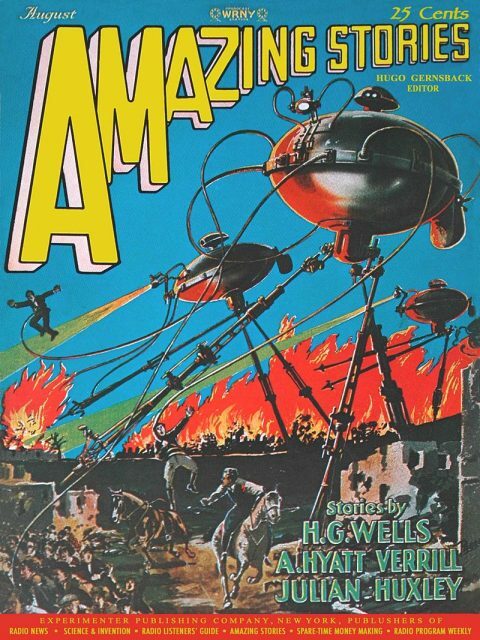 A handful of movies in the 1930s kept the steampunk flame alive, but science fiction, including steampunk, really began to take on a life of its own in the ‘50s and ‘60s, amid the atom bomb and the space race. Stories like H. G. Wells War of the Worlds and Conan Doyle’s The Lost World became attractive again, and Walt Disney decided to break from cartoons with Verne’s 20,000 Leagues Under the Sea. Disney had wild success, and the Victorian scientific romances were back in style. 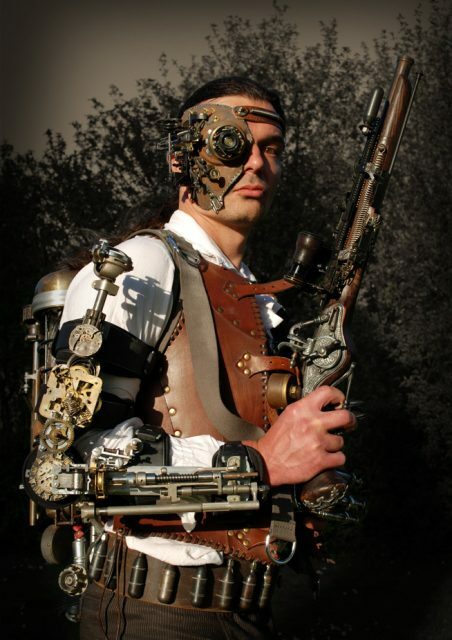 Steampunk went back out of fashion, for the most part, during the Vietnam era, its technological optimism out of step with current societal trends. But it survived, and by the late 1970s had finally earned the “Steampunk” name. The name itself was a semi-humorous offshoot of another type of science fiction that was gaining popularity – cyberpunk. Cyberpunk looked forward to a time when the boundaries between humans and computers have become increasingly fuzzy, and was rife with threads of rebellion against social norms. 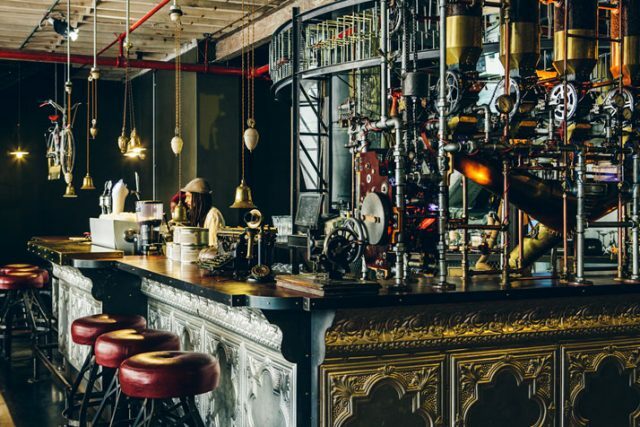 That spirit of rebelling from the rules of society was also common in those Victorian-era explorations of the science of its time, which often featured steam engines, so… Steampunk. 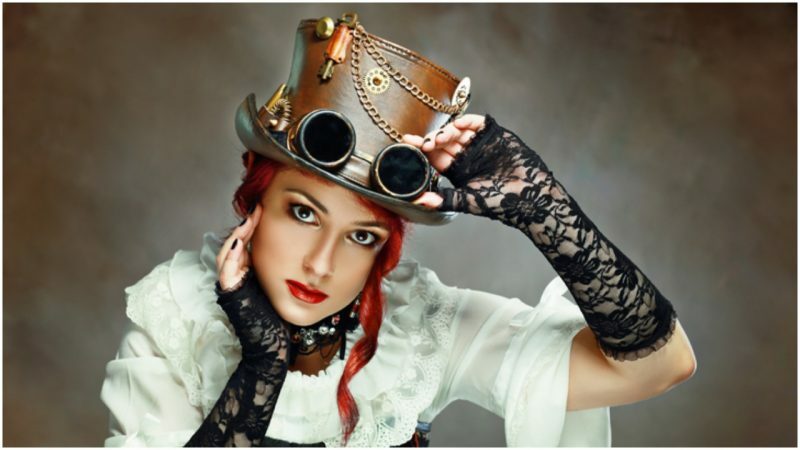 Today steampunk has moved from just being about books and movies to encompass a sizeable fandom and an entire subculture. 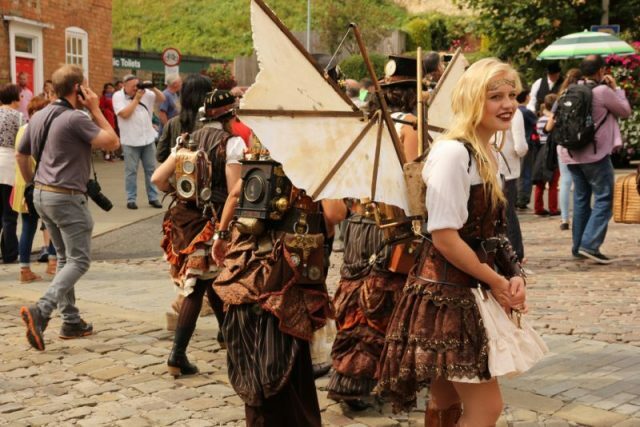 There are steampunk-themed conventions and other events, and fans can spend huge amounts of time, energy, and money coming up with cosplays that combine the most romantic elements of Victorian fashion with bizarre contraptions made of gears and clockwork. 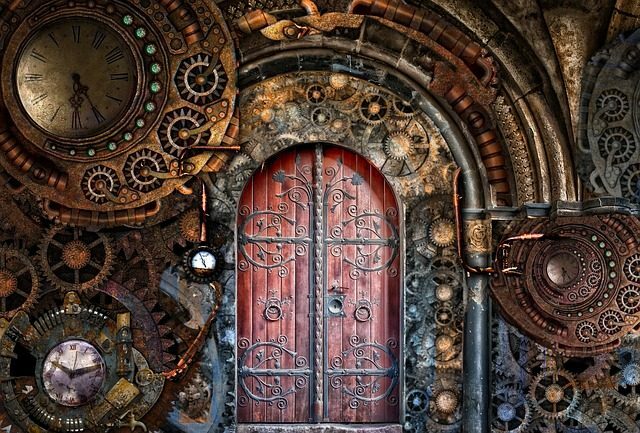 Despite the fact that steampunk as we know it has been around for over a hundred years, it’s clear that its combination of progressive optimism and scientific discovery still speaks to people’s spirits, even now.